See all RESP posts here. 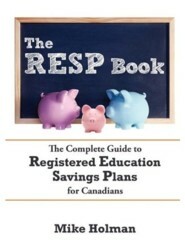 RESP – Registered Education Savings Plan. RESP is a type of investment account in which all income and growth are tax sheltered until the time of withdrawal and there are government grants which equal 20% of the contributions. One bit of advice is not to worry about contributing to an resp right away unless you are on solid financial ground. Make sure your own finances are secure before you start saving for a future uncertain cost. I’ve found that opening an account does allow relatives (read grandparents) a great avenue for gifts so that’s one reason not to wait too long. You have up to 18 grant contribution years starting in the year where your child is born or 1998 whichever is later. The last year you can get a grant is the year when they turn 17. Each of those years, the child accrues $2500 of eligible “contribution room” which means they will receive the 20% CESG grant. In any given year, they can get a maximum grant of $1000. For example if a child is born in 2007 and the parents start the resp in 2008, they can contribute $5000 right away and get $1000 in grants. Lower income families are eligible for more grants as well. When the money is withdrawn by the student, the original contributions are tax free (since they were already taxed) and the growth and income portion is taxed in the hands of the student. If the child does not go to school then the subscriber of the account can collapse the account and get the original contributions returned tax free and the growth and income portion will be taxed at their marginal tax rate + 20%. In that case the grants will be returned to the government. One thing to keep in mind is that the resp doesn’t have to be collapsed until the 26th year so even if you know the kid isn’t going to school you can delay the collapse and hopefully time it with retirement which would really cut down the tax bill. I think these plans are a great way to save for your child’s education because of the government grants as well as the fact that no taxes will be paid on the account until withdrawal – and even then the growth portion of the account will be taxed in the hands of the student, not the subscriber. There is the risk that the child will not go to school which would be a problem because of the taxes involved. However I’d say that one way to look at it is to think about how much money you will get back from the resp if the child goes to school (zero) and how much you’ll get back if they don’t go to school – not as much as if you had just invested it outside the resp but it’s still a lot more than zero. You can set these accounts up at pretty much any bank although I think the discount brokerages are the best place for these since they give you easier access to low cost index funds. TD e-funds are the best choice for these accounts. I would suggest having a high component of equity in the beginning (I have 100%) and then gradually switch to be more conservative over the years. I would think by the time the child is about 14, the account should be mostly money market or short term bonds. Warning – Don’t buy into group pooled plans since they are not a very good deal. If you are already in one then don’t worry about it, it’s not worth changing. I enjoyed the post, but I’m a little confused – your stated $2,500 of contribution room per year doesn’t agree with the numbers stated at the Canada Revenue Agency RESP page: http://www.cra-arc.gc.ca/E/pub/tg/rc4092/rc4092-e.html#P36_4823. On that page, they mention a maximum contribution of $4,000 per year, with a lifetime cap of $42,000, and the CESG matching is 20% on the first $2,000 contributed in a year, plus possible bonuses on the first $500 of the contribution depending on the child’s family’s income. Hi Hippo, I wasn’t very clear on that . The $2500 is the amount you can contribute each year and get the 20% grant starting this year. Previous years the limit was $2000. If you have unused grant room then you can contribute two years worth of grant room in one year and still get the 20%. Any more than that and you don’t get any grant. The info on the cra page is out of date. In actual fact the lifetime maximum has been increased to $50,000. Another note – the CRA computer system won’t be upgraded until the new year so if you start contributing $2500 this year then you will only get the grant on $2000 of it. The remaining grant will come in the new year. congratulation on your series, I think it is definitely a must for all parents to be! You did a great job covering several aspects of this topic! Thanks FB – that’s a great compliment especially since you have two kids and know exactly what you are talking about! Your example is slightly inaccurate. For a child born in 2006, you can only get a grant of $900 for a contribution of $4,500 made in 2007. That’s because the grant room is $400 in 2006 (under the old $2,000 limit) and $500 in 2007 (under the new $2,500 limit). Good point CC – I should have chosen different years! i am unsure what happens in the case that a RESP beneficiary dies – is that a special case of not attending post-secondary eductation or do the default rules apply?? Franko – RESP funds belong to the parents until they are used. I’m pretty sure they will get split if there is a divorce. I’m not sure about the bankruptcy – you’d hope they would get protection similar to an rrsp. Personally if I was in deep financial trouble I wouldn’t hesitate to use the RESP money to keep us afloat. You’re right about the broad definition of post-secondary education. If a beneficiary dies then it’s treated the same way as if they didn’t go to school. So the plan gets collapsed, penalties on earnings get paid etc. It can also be transferred to another beneficiary. RESPs are seized in bankruptcy. Don’t be fooled. You will lose them. OK, so RRSPs no longer ceased in bankruptcy as of July 2008, and RESPs are? If RESP is in trust for a child, and is locked in, isn’t it protected from ceasing?